The growth of the global temperature sensors market is gaining traction due to growing manufacturing electronics industries globally. The demand for temperature sensors is likely to increase substantially in the next few years due to widening its application in the wearable devices and consumer electronics. This is a key factor driving the growth of the global temperature sensor market. Growing oil and gas industries are fuelling demand for temperature sensors and likely to propel demand for temperature sensor market. However, technical awareness about sensor and heating issues in extreme condition is hampering the growth of the global temperature sensor market. According to the report by TMR, the global market for temperature sensor market was valued at around US$4.6 bn in 2015 and is anticipated to expand at a CAGR of around 4.60% from 2016 to 2024 to attain a value of US$6.6 bn by the end of 2024. In terms of volume, the market is expected to expand with a CAGR of 7.40% over the same period of prediction. On the basis of type, the global temperature sensor market is segmented into thermistors, thermocouple, resistance temperature detectors, infrared temperature sensors, bimetallic temperature sensors, and fiber optic temperature sensors. Of these, thermistors are dominating the global market for temperature sensors owing to demand thermistors has been higher than other types of temperature sensors. On the basis of technology, the global temperature sensor market is segmented into food and beverage, aerospace and defense, chemicals, oil & gas, semiconductor and electronics, automotive, healthcare, and others. Of these, the medical and healthcare sector is dominating the global temperature sensor market and expected to continue over the forecast period. The growing demand for temperature sensors in the advanced healthcare equipment is a key factor fuelling the global temperature sensor market. Apart from this, expansion of oil and gas sector is boosting demand for the temperature sensors. This growth of the manufacturing industry, semiconductor, and electronics industries in the developing countries is fuelling the growth of the temperature sensor market. On the basis of region, the global temperature sensor market is segmented into North America, Europe, Asia Pacific, Latin America, and Rest of the World. Of these, North America is dominating the global market for temperature sensor owing to the higher adoption of the temperature sensors in the region. The region accounted for 40% shares of the overall temperature sensors market in 2015. Increase in government initiatives in order to the improvement of the medical and healthcare sector in the region. Key players operating in the temperature sensor market include Panasonic Corp., ON Semiconductor, NXP Semiconductors N.V., Maxim Integrated Products Inc., and ABB Ltd. The temperature sensor market is highly competitive and fragmented. The top six players operating in the global temperature sensor market accounted for the 19% shares of the overall market. These key players are facing intense price war due to due to a number of players operating in the temperature sensors market and lack of variation in the products in terms of features and technology. The local players are offering these products at lower prices in order to gain substantial share in the global market for the temperature sensor. Additionally, the international players are entering into strategic partnerships which is increasing consolidation in the market. Temperature sensors refer to devices which helps in recording data related to temperature. A temperature sensor helps in converting any voltage or current into a specific numerical value. Advanced temperature sensors are also used in research and development facilities with various scientific uses. The contact and non-contact temperature sensors form the different types of temperature sensors. These contact temperature sensors have been used in different industry verticals owing to the low cost. These sensors are used when the thermal equilibrium needs to be maintained and there is no flow of heat between the objects where the sensor needs to be in contact with the object to measure the temperature. The non-contact temperature sensor helps in measuring temperature when the surface is moving and measures temperature with the help of heat radiation emitted from the surface or object. Temperature sensors have different product types, such as thermistors, thermocouple, infrared temperature sensor, fiber optic temperature sensor and bimetallic temperature sensors among others. These different type of temperature sensors include both simple and complex applications. Growth in automation, across verticals such as aerospace and defense, automotive, semiconductor and electronics and healthcare among others, has been some of the primary reason for the growth of temperature sensor market globally. The increasing importance for advanced healthcare equipment has also been boosting the growth of temperature sensor market. Other than this, the rise in demand for electronic products has also helped the global temperature sensor market to grow. Increasing use of thermistors, resistance temperature detectors, and infrared temperature detectors has also led to the rise in demand for automotive and healthcare sector enhancing the growth of these industries. Considering the positive impacts of the factors mentioned above, the temperature sensor market globally has been anticipated to grow at a good pace during the forecast period with the market being more or less stable. The growing demand for body worn temperature sensor also provides many opportunities for the growth of temperature sensor market. On the basis of type, the global temperature sensor market has been segmented into thermistor, resistance temperature detectors, thermocouple, infrared temperature sensor, fiber optic temperature sensor, bimetallic temperature sensor and others. The global temperature sensor market is further segmented on the basis of sensing method which includes contact and non-contact temperature sensor. The market revenue for temperature senor has been provided in USD million in terms of revenue and million units in terms of volume, along with the CAGR for the forecasted period from 2016 to 2024. Different end use industries which are segmented under the scope of this report includes food and beverage, aerospace and defense, chemicals, oil & gas, semiconductor and electronics, automotive, healthcare and others. Each of these segments are provided with market size and forecast for the period 2016 - 2024, further highlighting the different key trends which act as influencing factors for each segment provided under the scope of this report. The region wise market analysis provides the in-depth analysis of the current trends available in these regions which is further segmented into different countries covered under these regions. The different regions covered under the scope of this report includes North America, Europe, Asia Pacific, Middle East and Africa and Latin America. This report provides strategic analysis of the global temperature sensor market, and the growth forecast for the period 2016 to 2024. The scope of this report includes analysis of different market segments which are differentiated on the basis of product type, sensing method and end use industry of the global temperature sensor market across countries. To aid in proper decision-making, the report includes the profiling of top players in this industry, their respective market share along with various business strategies which are adopted by them as well as the recent developments. The key trends analysis and market opportunity map provided in the report discusses the various upcoming trends and current end use industries. Other than this, the scope of the report also focuses on the future penetration of various temperature sensor related products. 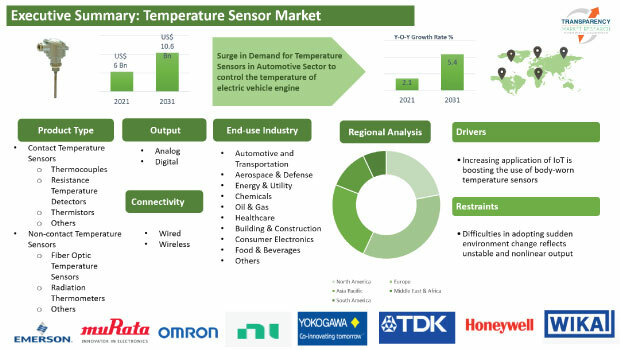 The market opportunity map and market attractiveness analysis included in this report provides overall insights into various market dynamics, industry competition, along with providing the most profitable segments within the global temperature sensor market. Additionally, the Porter’s five forces analysis aids in better understanding of the level of competition present in the market. Top players of the global temperature sensor market are also being profiled and included in the report. The report also provides breakdown and assessment of various factors impacting the growth of market, which are classified as market drivers, restraints, and opportunities in this report. These factors determine the different trends and their impact on the overall market growth. Overall, after taking into consideration the different factors which affects the global temperature sensor market along with providing a holistic analysis of the global temperature sensor market, and also provides an estimation of growth for the forecast period during 2016 to 2024. Some of the leading players in the global temperature sensor market are Texas Instruments Inc. (U.S.), Analog Devices Inc. (U.S.), Microchip Technology Inc. , Honeywell International Inc. (US), STMicroelectronics N.V. (Switzerland), Infineon Technologies AG (Germany), General Electric Company (U.S.), ABB Ltd. (Switzerland), Maxim Integrated Products Inc. (U.S.), ON Semiconductor (U.S.) and Panasonic Corporation (Japan) among others.